Hayes & Yeading gained a second home win of the season on a wet Saturday afternoon as goals from Louie Soares, Jake Reid and Kamaron English saw United win by the odd goal in five against a Whitehawk side containing former United defenders Tom Cadmore and Sami El-Abd. Manager Phil Babb made a change between the sticks for United, giving a debut to former Whitehawk keeper Jamie Young with the only other change seeing Jack Mills return from illness in place of Kelvin Bossman who dropped to the bench. The first effort of note came from the home side in just the ninth minute when a Tom Bird corner was nodded down to skipper Dean Inman on the edge of the box, his shot on the turn being flicked wide off the head of Jack Mills. Jamie Young got his first taste of action in the United goal shortly afterwards when he comfortably grasped a downward header from Danny Mills before a perfectly timed Inman tackle on Alex Parsons in the box a few minutes later saw the ball roll into his hands. 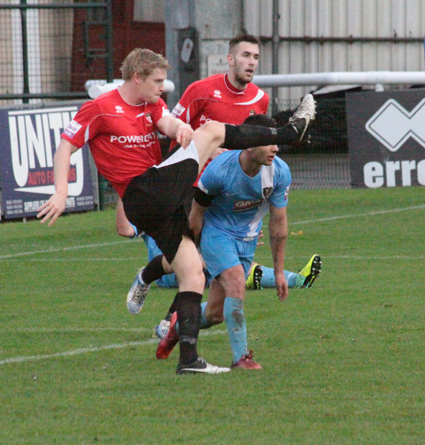 A minute later Luke Williams slipped in the box just as he was about to shoot having broken between two defenders and then on 28 minutes United broke the deadlock. Williams slid the ball forwards to Louie Soares, the experienced midfielder outpacing Hakeem Adelakun before cutting back onto his left and curling a perfect shot past Hawks keeper Dillon Phillips into the bottom corner (Pictured left). Almost straight from the re-start Young had to get down quickly to gather a 25 yard drive from Hakeem Adelakun. The Hawks continued to push for an equaliser and almost got it on 38 minutes, Tommy Fraser played a free-kick to El-Abd who sent James Fraser towards the United bye-line, his cut back being fired across goal on the volley by El-Abd. Within 60 seconds the Hawks however did pull level as Danny Mills collected the ball on the opposite bye-line following a defensive block and pulled it back to James Fraser who stroked the ball past Young from close range. Within 30 seconds of the re-start United were indebted to keeper Young who went full stretch to tip over a deflected goalbound Tommy Fraser drive after the Hawks midfielder had collect a partly cleared long throw-in on the edge of the box. Minutes later it appeared worse for United when Inman slid in to tackle James Fraser in the box and despite appearing to win the ball, referee Coggins pointed to the spot. David da Silva stepped up and despite his kick being struck firmly towards the right hand corner, Young got down quickly to touch the ball onto the post with Adam Everitt getting to the loose ball first to clear. 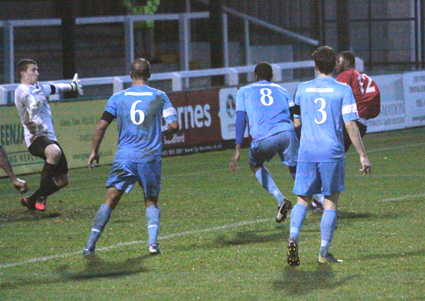 Relief at this escape soon turned to joy for Phil Babb's side as United took a 55th minute lead. Williams again sent Soares away, this time he moved around Phillips' dive before pulling the ball back to Reid who despite being nudged in the back by El-Abd managed to fire into the roof of the Hawks net (pictured right). With little happening at either end for a good 15 minutes, it was United who again struck. 72 minutes had been played when Williams chipped a neat free-kick into the Hawks area which found substitute Kamaron English, the former Watford winger controlling the ball with his right before flicking it past Phillips with his left (below left). The visitors defence were fortunate minutes later when a Tom Cadmore clearance attempt was blasted against Soares only for the ball to fly back into Phillips' arms while at the other end the Hawks should have reduced the arrears when Mills cross was met by Sam Gargan at the far post, his header going across the face of Young's goal and wide of the far post. United striker Geoff Mitchell saw a low shot held by Phillips before the visitors reduced the arrears in the 87th minute when Mills swept home a low cross at the far post. Far from panicking though, it was United who nearly found the net again when Mitchell was put through, his high driven shot being pushed away by Phillips before United saw out stoppage time to record an eighth win of the campaign.